The December 2, 2016 prayer rally in Jakarta. Donald Trump’s presidential campaign strategy and Brexit led to increasing concerns of a rising populism and post-truth era in the 21st century. In Southeast Asia, Philippine President Rodrigo Duterte was first accused of using similar strategies by advocating for the killing of suspected drug addicts to win support from the public. Populism has also had increasing success in Indonesia. Initial attempts, seen during Fauzi Wibowo’s embrace of ethnic and Islamic issues during the Jakarta gubernatorial elections in 2012, failed. Instead, the Jokowi-Ahok team won. A similar strategy in 2016 saw more success, however. Political opponents mobilized the people to overthrow Basuki Tjahaja Purnama (Ahok), then Jakarta’s governor. Accusing him of blasphemy against Islam, their message was simple and repetitive: Ahok, a minority Chinese Christian, was portrayed as unsuitable to lead Jakarta. The mass mobilization of people on December 2, 2016 is popularly known as the 212 rally. Leaders of the rally tried to objectively construct their actions as a moral movement to fight for the interests of Muslims in Indonesia. In social theory, however, it is almost impossible to construct a moral movement from a religious perspective. This is because religion is based on self-subjective values rather than common goals. 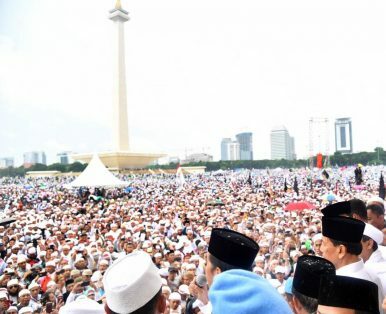 Therefore, the 212 rally is more suitably perceived as a political strategy of several political parties, including the Great Indonesia Movement Party, the National Mandate Party, and the Prosperous Justice Party. It was supported by the hardline Islamic Defenders Front (FPI) and Safeguard the Ulema Fatwa (GNPF), who have the goal of overthrowing political opponents. This is clearly shown by the fact that even after Ahok was sentenced to two years in prison for blasphemy, leaders still tried to mobilize another rally and raise support from the public, now by framing Jokowi’s actions as criminalizing Islamic leaders and scholars. Rallies continue, with a 212 reunion on December 2, 2018. Rizieq Shihab, the head of the FPI, stated during the event that 2019 is the right time to change presidents. He argues it is haram (forbidden by Islamic law) to vote for a president who is supported by political parties that support blasphemy. The party that Rizieq refers to is the Indonesian Democratic Party of Struggle (PDIP), which supports both Jokowi and Ahok. It is very easy to identify the strategy of those using political populism by conveying polarizing messages. The message is simple, clear, direct, repetitive, and very easy to remember. Their target market is emotional and rational-emotional voters. Emotional voters are those who have strong ties with an ethnic, culture, ideological, or religious entity that is shaped from birth. Emotional voters are divided into active and passive voters. Active emotional voters will actively show their anger and disagreements in public. In contrast, passive emotional voters prefer silent communication, but continue to avoid accepting any information that does not fit into their beliefs. Meanwhile, rational-emotional voters will tend to take time to process all information, but the influence of the values that shapes their identity remains relatively strong. Seemingly inspired by the success of 212, Malaysia is copying and pasting the movement by conducting the 812 rally on December 8, 2018. There are obvious similarities not only in the name, but in the messages also. The 812 rally is backed up by the opponents of the ruling Pakatan Harapan (PH), including the Malaysian Islamic Party (PAS) and United Malays National Organisation (UMNO). It was joined by 55,000 people. Former Prime Minister Najib Razak attended the 812 rally, as did several celebrities including Azwan Alu, Datuk Hattan, Abon, and Mustapha Kamal. The 812 message was primarily against the ratification of the International Convention on the Elimination of All Forms of Racial Discrimination (ICERD). Hadi Awang, president of PAS, stated that the values of ICERD are against Malay culture and against the values of Islam. There were concerns, seemingly unfounded, that ICERD would undermine the constitutional privileges enjoyed by the Malay bumiputera under Article 153, as well as undermine the power of the Sultans. Therefore, UMNO President Zahid Hamidi, arguing that the PH is supported by a majority of non-Malay and non-Muslim supporters, stated that the government could endanger the interests of the Malays. Even before the rally, however, Prime Minister Mahathir Mohamad had announced that Malaysia would not ratify the convention. As such, while Zahid stated that 812 is not a political partnership, the rally clearly shows an attempt to build a political narrative centred on their representation of Muslims to return UMNO to power. UMNO has always focused on religious and ethnic issues for legitimacy, but this seems to be intensifying following their loss. The 812 rally is the action they have chosen to distract from the 1MDB affair, which allegedly involves the corruption of elites in UMNO, including Najib, as well as rally support around the embattled leadership. However, such a message, while emotionally appealing, does not necessarily mean they have assisted many of those they claim to represent in the past. Nor does it mean the current government undermines Islamic rights. 212 + 812 = ? Malaysia seems to have learned from the 212 rally. 812 was done smoothly and they encouraged everyone to collect garbage and not smoke, in order to showcase purity, similar to the message shared during 212. In Indonesia, political opponents who support the hashtag “change president 2019” rampantly tweet that 212 and 812 are symbols of rising Islamic civilization in Indonesia and beyond. Popular artists such as Arie Untung even tweeted that 812 showed the power of ukhuwah (Islam brotherhood). As such, linkages were forged — despite the fact that Indonesia itself ratified ICERD on June 25, 1999. 812 deployed the political narrative of 212, which is not only mobilized to win support, but is also extremely difficult to combat due to its emotional appeal. While PH members argue that the fact that the rally was allowed to take place shows they support various viewpoints within Malaysia baharu (New Malaysia), this may not be enough to counter a narrative that has such strong emotional resonance with many Malay voters due to the insecurity they feel. In both countries, conservative Islamic followers feel increasingly marginalized and target the tolerance shown by the current governments as a reason for this occurring. What is clear is that Indonesian and Malaysian factions will be learning from one another, and will be increasingly advancing emotional messages based on Islam in order to fight for legitimacy through populist appeals. What is less clear is the impact it will have on the current governance in both countries, as opposition becomes even less programmatic and more emotional. Asmiati Malik is a political economic analyst based in London, UK. Scott Edwards is a doctoral researcher at the University of Birmingham with a research background in the international relations of Southeast Asia.